I am so sorry for your loss. You did a Mitavah by giving her a loving home for her few remaining days. As an animal lover, you touch my heart with her story. The blessing you wrote is wonderful. I will keep it to use when I need it. I too am sorry for your loss. We lost our beloved Jasmine of 14 years, just before Yom Kippur. Thanks to you, we now have a prayer for her. Thanks to our faith that gives us the rituals of dignity and respect for times like these. Our faith also teaches to be kind to those who mourn, and to have courage in the face of adversity and pain. Thank you David..thank you very much. Thanks for the prayer 6 months ago I lost Otto after 7 years, this month I lost Fips after 10 years. It is so nice to have a prayer to say as she is layed to rest. We have a menagerie of six cats, two dogs, and until today, two leopard geckos. Sadly, little Zac the Gecko died this evening after a brief illness. I never thought I would be constructing a coffin for a reptile, but I just finished fashioning a simple creation with cardboard and construction paper, and I wrote your prayer on a scroll and put it inside with Zac. I know our 10-year-old will be comforted by your wonderful blessing when we have our gecko funeral tomorrow. Thank you. Found this blog via another, and now have a prayer for my cat Sheba, who died June 3. Thank you. It’s a beautiful and simple prayer that I will say for my wonderful cat who died today after living a happy and healthy life. Thank you for this beautiful prayer. My family lost our beloved pet Cuddles yesterday. She was a beautiful Shepherd/Husky mix that we adopted when she was 5 weeks old. She lived with us for 16 years and 4 months. 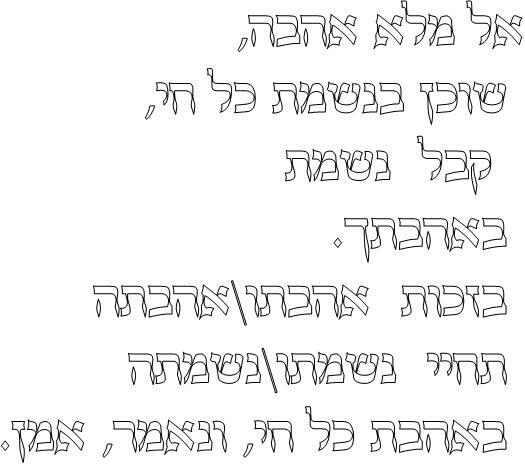 I recited Kaddish for her and will also recite this prayer. When you live with an animal for so long, I believe you come to realize that they too have been blessed with God’s gift of a soul, which is the source of their unconditional love for people. Thank you for this. We will be using it to memorialise our cat Molly tonight. She died on May 15th 2010 after a brief illness, and she was loved as much as it is possible to love a cat. She is missed so much. Thank you, thank you Rabbi, for offering a prayer for our loved furry friends. My daughter and son-in-law today lost a beloved cat, Dana. I am to say some words tomorrow at a service and your tender prayer will be read at the end. Thank you for posting it. Shalom. Thank you Rabbi. We had to put down our beloved 7 yr old Golden Retriever, Dakota, 10 days ago. I’ve always believed that the Eternal One loved all his creatures and that a prayer is appropriate. Thanks to you I have one. Shalom.